During either player’s turn, you can activate “Magical Musket” Spell/Trap Cards from your hand. 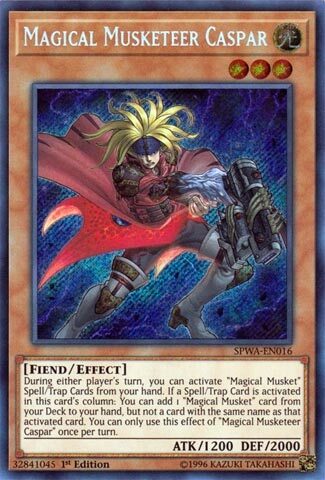 If a Spell/Trap Card is activated in this card’s column: You can add 1 “Magical Musket” card from your Deck to your hand, but not a card with the same name as that activated card. You can only use this effect of “Magical Musketeer Caspar” once per turn. Magical Musketeer Caspar is the first “Magical Musketeer” that we’re reviewing on CoTD. The inherited ability to activate archetype-specific spells/traps from the hand during either turn is a significant advantage this archetype has against all other decks. Caspar has some good stats and support behind him, and his search ability is very easy to activate. Just line up a spell/trap in the same column and activate it, then you get any “Magical Musket” card from your deck. Caspar can search a card and then you can activate it immediately from your hand if it is a spell/trap. This is a once per turn, but you can get a search during either players turn with the ease of activating Caspar’s search ability. Play a spell/trap from your hand during your opponents turn in the same column and get your search. Lets not forget that if a spell/trap is activated in this column from your opponents side that Caspar will still kick. Caspar is the most important piece for the Magical Musketeer deck because it is the best one. First, you can activate Magical Musket Spells and Traps from the hand during either players turn, which all of them do, and the Magical Musket Spells and Traps are all pretty good, some are optional, some are just staple, all worth considering investing deck space for. The unique effects of all Magical Musket monsters requires you to use the Spells/Traps in the same column, excluding the boss monster. Caspar’s unique effect is that he can search a Magical Musket card with a different name than the Spell/Trap used in the same column as him. That is a hard once per turn, so don’t think you can get your whole deck to your hand with ease. Thankfully for the Magical Musket cards, they don’t have to be Spells/Traps of the archetype to trigger the unique effects, and Caspar is where that really shines as using an Upstart Goblin in the same column means you can search anything Magical Musket related. Even on your opponent’s turn, you can use a Magical Musket Spell/Trap from the hand thanks to your monsters and get a search from Caspar if it was in the same column, but remember it has to be different from the card you activated, which I guess isn’t too bad considering all of the Spells and Traps in the archetype can only be activated once per turn. Overall, as I referred to in the What You Should Know article, Magical Musketeers have the best chance of topping any events, and I guarantee you any Magical Musket deck list will have three Caspar, because he is the best one, and three Starfire to get to Caspar that fast, he is that important. Click here to read more Yu-Gi-Oh! Cards of the Day!